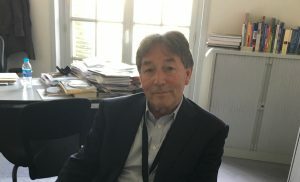 Paul Docherty took up the post of Director British Council France in April 2013. Prior to this he was Director UK 2012, Director British Council Scotland, and Director British Council Italy. He has also worked for the British Council in Helsinki, Moscow, Prague and London. Can your briefly explain your educational and professional background? I was born in Egypt but only lived there for a short amount of time as my dad was in the Royal Air Force and we moved around a lot. My family is Scottish and I got sent to a boarding school in Scotland at a relatively young age. I studied History and after graduating from Strathclyde University, I went to Spain to teach English Language & Literature. I had initially planned to stay for a year, but stayed for six. These six years abroad strengthened my determination to pursue an international career. I then went to Moscow State University, but only stayed for a year. My stay was cut short due to political differences being strong at the time. After completing an M.Litt. in Linguistics, I joined the British Council. I had worked with the British Council as a teacher when I lived in Spain and had become familiar with all the other activities and initiatives that they had at the time. I found these interesting and felt that my education and experience were pointing me in this direction. I took up the post of Director of the British Council France in April 2013. Prior to this, I was Director UK 2012, Director British Council Scotland, and Director British Council Italy. I have also worked for the British Council in Helsinki, Moscow, Prague and London. What is your connection to France? Do you speak French? Where you familiar with the French culture before you moved to Paris? No. Unusually, my schoolboy French was really poor and I had no particular connection to France before moving here. The British Council would normally send someone with very good French and a good understanding of the French culture and values. I was very lucky because they needed someone to take up this post quickly and I was available. A curious thing about working for the British Council is that although you are in a foreign country, you are working in an English environment. It is hard to learn the language of the country that you’re in when everyone around you speaks very good English. How long did it take you to become fluent in French? It look longer than I initially thought. Once you’re doing the job, because you’re not working in French you have to take lessons and finding the time to do lessons is actually quite hard. It took quite a long time. Now I can manage, but it is not as good as I would like it to be and it is not as good as it should be. I think that it’s important for us to send people to different places that already have a good knowledge of the home language. This definitely helps and is an important gateway to the culture. Has this had a detrimental effect on your work? No. It hasn’t been a difficulty in the job. Things have changed in France. 10 or 15 years ago it would have been much more difficult but nowadays the majority of people that we work with have a very good level of English. I can manage in French and have found that most people are happy to conversate in English. Not having a very good command of the home language is not detrimental to your work, but a good command is certainly desirable. How does the work of the British Council in France benefit Franco-British relations? This is a really good question and also a hard question to answer. I take comfort in the fact that it is also a hard question for the French institutions in the UK and the British institutions in Italy, Spain, and elsewhere. What exactly is the contribution? The contribution is hard to measure because some of it is quite intangible. Having said that, I would say that we provide a formal mechanism for both sides, in this case France and the UK, to engage through culture and education. These exchanges, alongside other aspects like business, defence and security render a strong relationship between France and the UK. Most aspects of the Franco-British relationship are formal and aimed at government officials. However, culture and education are broader and much more informal. The British Council in Paris works as a mechanism that facilitates Franco-British contacts and exchanges; exchange of ideas, information and other aspects of culture. The official connections that we have are aimed at the public. We work to cultivate public opinion abroad and mutual understanding. We often talk about how we encourage people talking to people, and not government to government because that is handled elsewhere. That’s the space we occupy, that’s the role we have. Why should soft power (cultural and public diplomacy) be prioritised as a foreign policy tool? The British Council would probably make a distinction between public diplomacy and cultural relations. Public diplomacy usually aims to promote a particular view of a country, which has a political process or intention behind it. There is a subtle distinction, but whenever anyone engages in soft power, there are number of different points along the spectrum where you can choose to operate. At one end you would have public diplomacy which is fairly controlled by the government and at the other end you would find pure cultural relations. Cultural relations are a dialogue. They give space to different voices, space for people to engage in human ways, space where all opinions and ideas are free to be discussed. I would certainly like to see a prioritisation of public diplomacy but realistically, this is something that is not going to happen. I don’t think that public diplomacy should necessarily be a priority. Governments will engage in all kind of areas that will allow them to have peaks and troughs with other countries. Cultural relations on the other hand can maintain a steady line. They are people-to-people relations; discussion, dialogue, engagement… and these are things that are not necessarily linked to politics. If you take the example of Russia; everyone would agree that the relationship between Russia and the UK is not a good one. Despite this, we have just finished a year of Anglo-Russian collaboration in a number of areas; mainly in culture but also in the arts and education. When you look at this, you can see that the conversation hasn’t stopped, it hasn’t been terminated – there is still space for that. Even if the political relationship is weak, we can still arrange to have major exhibitions at the Science Museum in London, about Russian and Soviet space exploration successes. The story of the Soviet space program and effort is an amazing story and we’ve been able to tell that story. The British Council was involved in making some of the connections that allowed these conversations. For example, by contacting Yuri Gagarin’s daughter. Do you feel the national projection of the UK in France has suffered as a consequence of Brexit? If so, what will/has the British Council do/done to counteract this? Has your outreach strategy changed? I think it has. We don’t have a huge amount of data but we do have some data. We know for example that there has been a 9% drop in UK universities applications from EU students and that would include France. In regards to France, we don’t have any stern data at the moment but it does seem that the view of the UK as an attractive destination for educational exchanges has been affected. I am afraid that this is due to the UK giving a very strong impression that people are not welcomed. Whether this is true or not, it is certainly the perception that saddens me the most. My whole working life has been focused on trying to promote connections between people and we quite certainly have a number of barriers which are politically driven. The whole spectacle of us deciding that individuals are a bargaining chip in the negotiations is, in my view, wrong. I am not happy about that and it does seem to be having an impact, whether that impact will be long term or not, we don’t know. What is very interesting is that whereas we do have a great higher education system with top leading universities, there are other factors that contribute to making the UK an attractive study destination. Language is the strongest factor. People are pragmatic and you don’t necessarily have to go to the UK to receive an English education. For example, inquiries to go to Ireland have massively increased. This is also the case for other places such as the Netherlands, where a large percentage of courses are taught in English. Not only is the view of the UK being damaged. Pretty much all academics would agree that our system is enriched particularly by our Europeans students that flow freely on the borders of the mind, and we would be very sorry to see that reduced. What does this mean for us in terms of what we do, and what’s the response? I think in some senses it won’t make a great difference because our purpose has always been to encourage engagement and one could argue that the need for that is even greater than before. I don’t think that there’ll be a strategic change in terms of what we do, but perhaps an increase in initiatives and activities. The problem with this is that culture and education exchanges often tend to be at the end of the queue. Other aspects such as health, national education and defence are always prioritised. Nonetheless, this may change. We are beginning to see some of the things that will happen as a result of Brexit and I think that we’ll simply have to keep going on. The relationships with Europe are likely to take a nosedive. There are a number of political reasons why the EU can’t allow the UK to benefit from the referendum. The EU has to be tough, not only for this reasons, but also because the EU itself is under a huge threat. I think that in historical terms we’ll probably look back on this and we’ll see that the Brexit vote was a wake-up call for the European Union. If you look at what’s happening, not only in the UK, but in the Netherlands, France, Germany, Greece… with the rise of far-right nationalist parties, and issues in Spain and Italy… one can say that the Western European Union is under threat because there are groups inside these countries that feel disadvantaged and neglected. The work of the British Council for these people and for most of the people in the UK that voted for Brexit (52%) is probably irrelevant. When working in Russia, it was easy for us to work with the liberals, with the people who wanted change, we didn’t really work with the communist die-hards. However, I always thought these were the people that we should be trying to influence. Reaching these people, understanding what their issues are and finding a way of engaging with respect in mutual dialogue would be a beneficial soft power focus. To answer your question, our fundamental principles have not changed. However, we will try to do more and to think harder about the areas that we’re not reaching. When speaking about Franco-British relations, most people focus on a Paris-London level. Could you talk a little about France-UK cultural exchanges from a regional perspective? What regions in France and the UK are more active in these exchanges? This is very common for institutions like ours. When you are based in a capital, exchanges tend to be capital dominated. In regards to the conversation that we just had about Brexit, we would certainly benefit from France-UK regional cultural exchanges. This is something that requires more resources and to be honest, we (British Council) haven’t cracked that here yet. There are about 6 to 10 cities that you could name immediately in France where there are very serious places, cultural hubs and educational hubs, and arguably we should be doing as much in these places as we do in Paris. The British Council used to have a small teaching operation in Marseille and Lyon but it recently closed due to lack of income and profit. That was a great sadness. Nevertheless, we do work quite a lot with Lyon and Marseille. Marseille is a city that is twined with Glasgow and that is an interesting connection that we can support. Lyon has a very interesting cultural heart which is growing in importance and which we’ve been supporting for several years now. We try to work with other cities such as Aix-en-Provence, Lorient and Avignon. We also support exchanges between Britanny and Scotland. For example, with Celtic music concerts and so on. These are some of the things that we can do, but again it’s a disappointment to me that we haven’t been able to do more. Nantes is also a fascinating and interesting city in France. When the city suffered from economic decline, Jean-Marc Ayrault, the Mayor, decided to make the culture and arts the new generation of the city. Jean Blaise is another well-known character who has been working on this idea for a very long time. What you see if you go to Nantes now is a really interesting cultural centre. In terms of education, its university also decided to concentrate and prosper in specific areas, such as science. Nantes is an example of a city that has decided to use cultural and education assets to regenerate. The success is impressive. The case of Nantes is similar to that of Liverpool, which regenerated and became one of the first cities of culture in the UK. We’re trying to make sure that links between Nantes and Liverpool are strengthened. What is your favourite aspect of living in Paris and being exposed to the French art de vivre? It is precisely that which I enjoy the most. Simple things that make life more enjoyable and which are important to the city. Things like having a market under my home. I rarely go to the super-market here. I really value this. Buying food in markets is perhaps more expensive but it is more human and certainly worth the money. I speak to the vendors and we discuss recipes, they give me advices on how to treat a certain product and so on. What’s behind this is the intention. The city of Paris arranges operations (installing, cleaning) to assure that markets can take place. Parisians enjoy and value markets and they are an aspect of the city’s culture and charm. Similarly, there is always something going on under the surface. Paris is a very vibrant city. October 7, 2018 in General. Help our students develop more projects with a small contribution.